The sand dollar embryo in this image is in an early stage of development called a blastula. 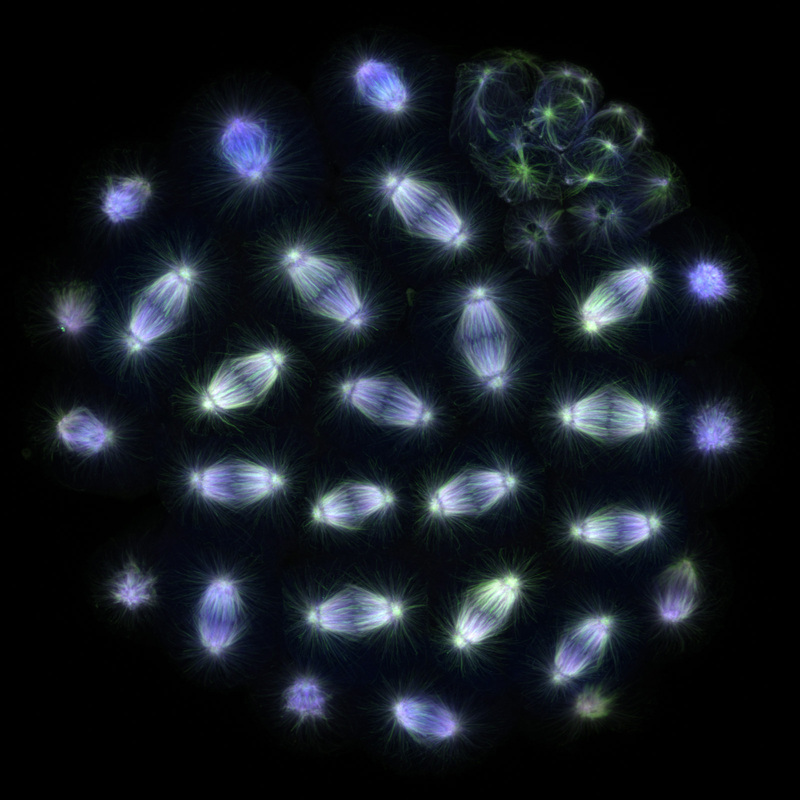 Certain groups of cells in the blastula are synchronized to divide at the same time through mitosis. Most of the cells in this blastula are midway through their eighth division. However, a small cluster of cells in the upper-right corner of the image are on a different schedule. The four smallest cells at the center of the cluster are beginning their last division before the embryo becomes a larva. These four cells will eventually give rise to the sand dollar’s germ cells. The cells in the immediately surrounding area have just completed their sixth division. These cells will ultimately play an important role in various developmental processes, such as cell differentiation, the formation of the digestive system, and the development of an exoskeleton called a test. Despite their different characteristics and roles, all of the sand dollar’s cells (except for eggs or sperm) are genetically identical due to mitosis. The downloadable Educator Materials PDF includes background information and implementation suggestions for using the image as a phenomenon. The Student Handout includes the images and background information. Image Credit: George von Dassow, PhD, Oregon Institute for Marine Biology, Charleston, OR. This animation gives an overview of how a fertilized human egg develops into an embryo. This animation describes the formation and fates of the three germ layers in a human embryo. This interactive module explores the phases, checkpoints, and protein regulators of the cell cycle. The module also shows how mutations in genes that encode cell cycle regulators can lead to the development of cancer.